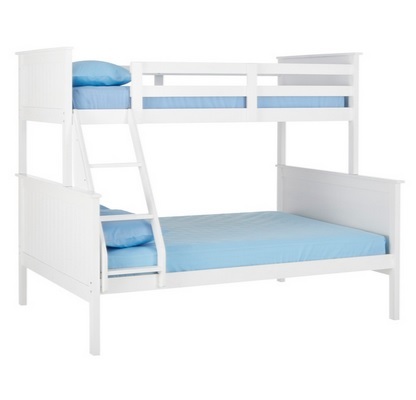 Great for kids’ rooms and guest bedrooms, this stylish trio bunk bed comfortably sleeps two underneath and one on top. As your family grows or your needs change, then separate the bunks to create a single and a double bed. This versatile design means you have the freedom to choose how you use it and style it to suit your home. Accessories and mattress not included. 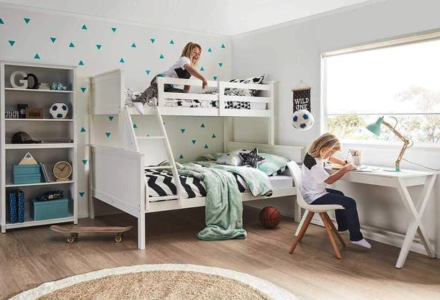 This charming and practical bunk bed sleeps one on top and two underneath for the perfect space saving sleep solution for siblings and guests. Featuring an elegantly timeless design in crisp white, this charming bunk bed will look fabulous and won’t overcrowd even the smallest room. High safety rails and a built-in ladder mean little ones can climb up to bed and sleep safely and soundly all night long.